I hope you had the chance to see how I launched my seasonal/holiday/book-themed Word Work Centers HERE and got some good ideas for your own classroom. After we've gone through the Back to School Word Work activities, I dedicate the next week to learning all about the permanent Word Work Centers that they would use throughout the year for any and all word lists they work with, including vocabulary lists, word wall words (Math & ELA), spelling lists, and more. *If you're interested in these labels, they are available in my TpT Store HERE. I began by splitting up each table into a different center. Students could practice any words from the Back to School Word List that were already very familiar from Word Work over the past week. They recorded their work on white boards to show me at the end. I floated around to provide guidance, reassurance, and give some extra help to some of my stugglers (including tips about the lower levels of the Word Worth and Place Value boards). After a few rotations, they had a good sense of the activities and the different levels within them. During our yearly Daily 5 rotations, they will have a little longer than 20 minutes to work on the activity of their choice, so being comfortable with the options as well as knowing where and how to show their work is key during this introductory period. 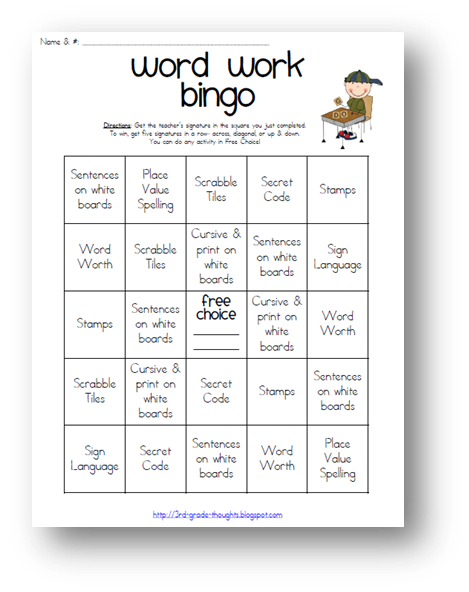 By the second day, I was ready to introduce my Word Work Bingo Board. This has been a lifesaver for me since it allows the kids to choose their Word Work activity, but also ensures they are getting varied practice throughout the week. I always create a few versions and rotate them throughout the year to keep it fresh and fun! Students are welcomed to work someplace comfortable in the room and spread out, if necessary, which is often needed with the supplies they use for these centers! After students have worked in the Word Work Center of their choice for the 20-minute session, they come see me for my initials in the square. Five of my initials in a row= BINGO! In order for me to initial, I tell them I'd like to see five or more words practiced. As the year continues, I will up the ante a bit, but I'm still giving them some leeway since this is all so new. For the Sign Language center, I have them try to show me one word using the ASL alphabet and they can use the cheat-sheet if they need to. It's all for fun, so I am not too strict unless I see someone who has blatantly done no work during that time. Starting next week, we will be using these permanent Word Work Centers for our spelling practice throughout the week. I find it a wonderful way to keep them engaged and working on cross-curricular skills, which is always a bonus! I have heard from many of you that you send these sheets home for homework as well, which is a fantastic way to have parents help in a meaningful and engaging way! 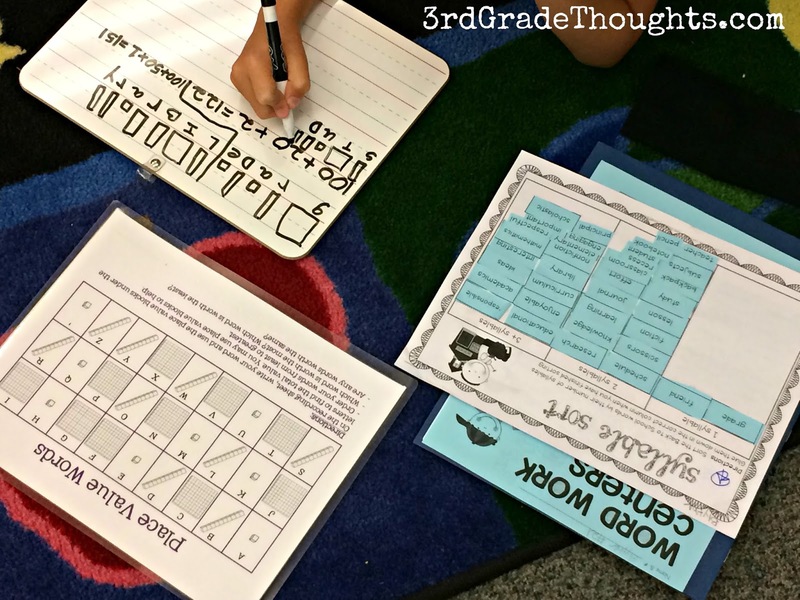 I hope this gave you some organization and implementation ideas for your own Word Work Stations this year! 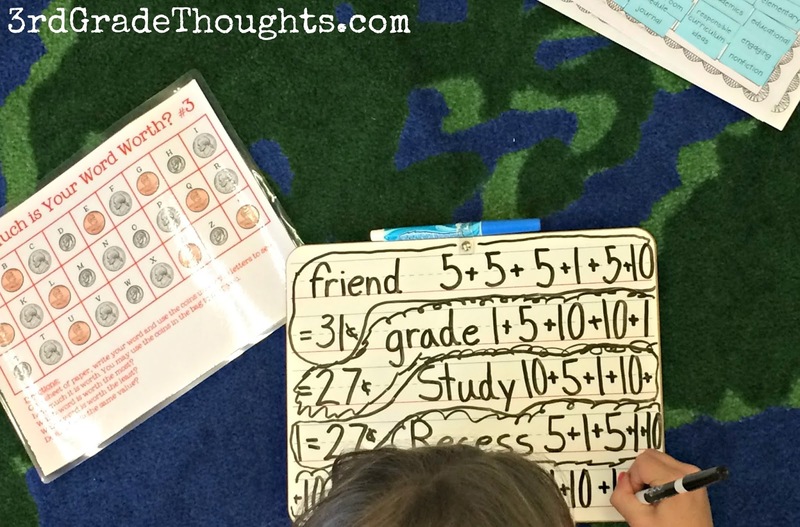 I like the idea of using white board for Place Value Words and Word Worth. I've always used the recording sheets you provided with the product, but white boards would be so much better! Thanks for another helpful post. I love this! 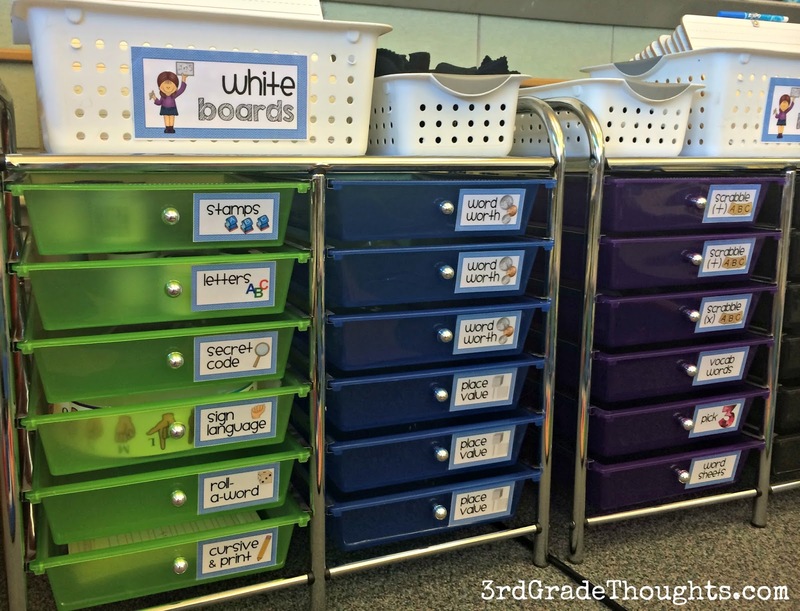 I need to organize my spelling stations like this! Yay! So glad this post helps!! I love the front of our room now with these labeled bins-- like a daily dose of zen in the morning :) Happy organizing! I am so excited to have found you and your blog! I spent all day reading post after post and downloading products! Fabulous - all of it! Thanks so much for sharing. I am encouraged that I can do this too - with all these great ideas. What a blessing!